I was just chatting with a friend yesterday about shopping and she had the same mentality as me. 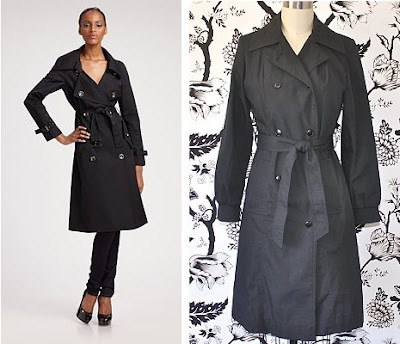 Growing up without a lot of money to spend on clothes, I learned how to look at higher end stores to get ideas and then would try to find similar items at thrift stores and garage sales. Now that I have made a business of this skill, I thought it would be fun to compare a couple items in the shop with their new counterparts. 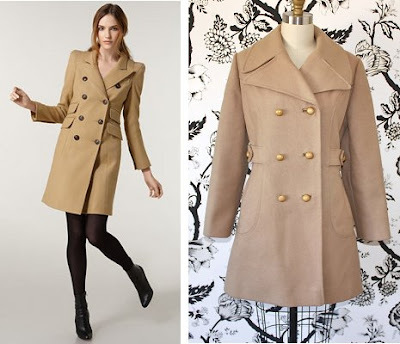 Two essential styles of coats to have in your wardrobe are the trench and the military style pea coat, let's see how Salvage Life's coats compare to the new options available. Obviously, I couldn't find exact matches, but I am amazed at how much can be spent on a coat. Salvage Life is clearly offering a more affordable product and there was no new manufacturing, packaging or waste involved. 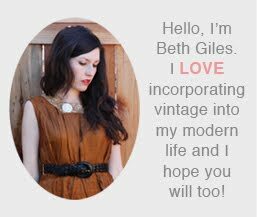 I'm looking forward to filling out my fall wardrobe with vintage pieces that look like their new counterparts, I just think it makes sense considering designers use vintage clothing to inspire their designs, why not buy the original? There is still a few hours left to win the vintage swimsuit giveaway, be sure to leave your comment on this post. you should do more of these posts = love it!